Here you go some newbie tips I had in the treasure trove, remember them is never a bad idea. If you need to a pool of fluid you always need to relax the fluid to get a initial state, you can simulate during a lot of frames. 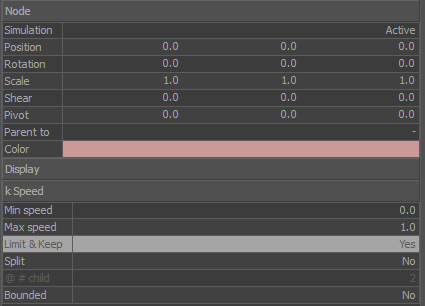 To accelerate this process you can use a KSpeed daemon activating the limit&keep option, I use to animate the Simulation attribute in the first frame…. 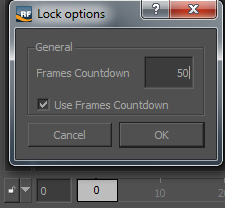 … and activate the Lock function in the time line, depending on the scene set up it´ll be needed increase or decrease the number of frames for the countdown. Adding some randomness in the emission, you could do this with a simple expression in the speed attribute 4.5+rnd(1), 4.5 is the main speed. You can use a Noise daemon linked to the emitter and bounded to the space icon. Using droppers, a dropper is a basic geometry to make the fluid collide before to drop down, you can make it simple with planes or modelling it in a 3d platform so you could get nice and realistic patterns. Remember RealFlow is not in essence a Computational Fluid Dynamics software (CFD) and works always in vacuum, so if you would need to simulate with accuracy you will need to add a second fluid -air- interacting with the main fluid, but this could be against the simulation times. It is really important the normals aim to the collision side in order to get correct results, the sticky attribute is a force applied to the colliding particle and is inverse to the geometry normal. More old stuff, I did this using Hybrido. I have not enough memory to render it but is cool anyway. I did it animating a surface geometry in a similar way as a membrane in a speaker, around 25 millions of particles. This script is to create primitives with more resolution, simple but useful. Some primitives are not supported because it does not exist scripting options for that.